super robot taisen z ~ aeon genesis ~ Your eyes are as blue as window cleaner! « Reply #30 on: June 29, 2008, 04:10:44 PM » by Ianator is Gaius Baltar. Seriously guys. This is looking awesomer and awesomer. And the release date of September 25 is apparently mostly final, as they're already almost done! « Reply #31 on: June 29, 2008, 09:11:32 PM » by JayBee That's how I roll. Insert Credit had a blurb about that. They also noted that the franchise is popular enough that SRWAPortable knocked Metal Gear Solid 4 off the top of the sales charts, despite being a PSPort. Some mechs are just better than others, I guess. « Reply #32 on: June 29, 2008, 09:46:03 PM » by Ianator is Gaius Baltar. It seems as though they also covered (albeit a little late) AGTP's Live-a-Live 2.0 patch. So, thoughts? I'm really digging some of the little things. Like how when Overman Rush Rod is frozen by those missiles, it doesn't hit some nonexistent "ground in the sky" like what usually happens in SRW. And also that big combined enemy that gets Tomahawk'd by Getter Dragon actually blows up piece by piece instead of just suffering some generic explosion. Impulse skewering Freedom is also worthy of mention, I guess. One question I have about Z is the originals. Since it's starting a new continuity supposedly, will the original characters start out with gespensts or grungusts? 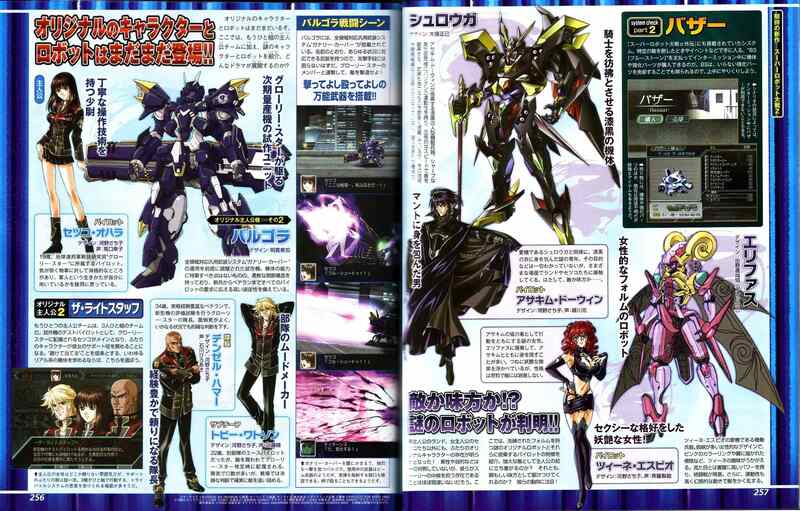 Will there be a Real or Super Robot route or will it just go through the game like Alpha Gaiden? « Reply #34 on: July 02, 2008, 11:05:36 PM » by Ianator is Gaius Baltar. The originals are completely new, and you will be able to choose between a Super (male pilot w/ female copilot) and Real (female pilot w/ two or three assistants). There's not much more, but you can check up on GameFAQs if you want. « Reply #35 on: July 25, 2008, 04:45:44 PM » by Ianator is Gaius Baltar. Its Element System will activate at 130 Morale, and will take its pilot stats from the highest ones available (meaning if Sylvia has the highest Shooting stat, it'll help even if she's not the head pilot). Gravion is interesting... Grankaiser can use the Gasshin! command to form God Gravion at 130 Morale, but it'll only last for three turns! I, for one, see this as an opportunity to make Gravion crazy powerful, but I've heard some moans about this. Gundam X's Sattelite Cannon apparently needs four turns to charge up (upon which there's a spiffy cut-in), and can only be used on stages where the moon is visible. Once charging is complete, it can be used as either an ALL or MAP attack. Thanks go once again to GameFAQs user greato_booster for this wonderful information! « Reply #36 on: August 07, 2008, 05:52:08 PM » by Ianator is Gaius Baltar. The Super, GunLeon, is the orange mech with a wrench (F**K YEAH!). Its main pilot is Rand Travis, a mechanic searching for his missing master. His copilot is Meer Peter, his master's daughter (and also claims to be Rand's fiancee...). The Real, Balgora, is the blue mech. Its pilot is Setsuko Ohara, a pilot with the military R&D group, Glory Star, though she has doubts as to her capability as a soldier. Her support comes from the veteran, Denzel Hammer, and the ace pilot, Toby Watson. The black rival mech, Shroga, is piloted by the vampiric-looking Asekim, while the Angelg-with-goat-horns, Elifas, is piloted by the gives-Garnet-a-run-for-her-money succubus, Sine. COME ON, PEOPLE! THIS IS BIG! as I said else where the Gunleon must do GGG proud! « Reply #38 on: August 09, 2008, 03:34:58 AM » by JayBee That's how I roll. The super's copilot has what can only be described as a Practical Combat Outfit. Brand new previews W/ attack demos of each series. « Reply #40 on: September 17, 2008, 04:27:55 AM » by Ianator is Gaius Baltar. Nine days, people. What are you doing to prepare? I've gone through Overman King Gainer, Gravion and Zwei (plus Dancougar Nova) and am currently working my way through Aquarion TV. *Sings*: "GAN GAN LEON GAN LEON!!" I'm...sulking for my ps2 being a hundred-and-such miles away from my campus. « Reply #43 on: September 17, 2008, 09:25:59 PM » by JayBee That's how I roll. I watched that one a while back out of morbid curiosity, and still can't get the unclean feeling out. I managed to find a torrent with the original Dancouga series+OVAs. That helped a bit, though I skipped through all the non-action parts of Blazing Epilogue because it's untranslated. THAT is what I call a sword. Should probably get a video editor and upload a not-VHS rip of that. « Reply #44 on: September 17, 2008, 11:04:58 PM » by Ianator is Gaius Baltar. I'm... so sorry. I watched that one a while back out of morbid curiosity, and still can't get the unclean feeling out. I actually enjoyed it a fair bit - found it quite refreshing, considering I'd finished Gravion Zwei just hours before. It'd be nice if Z2 (or even Z3, God willing) gives us a FINAL-MAXGOD DanKuuCougaKen combo. 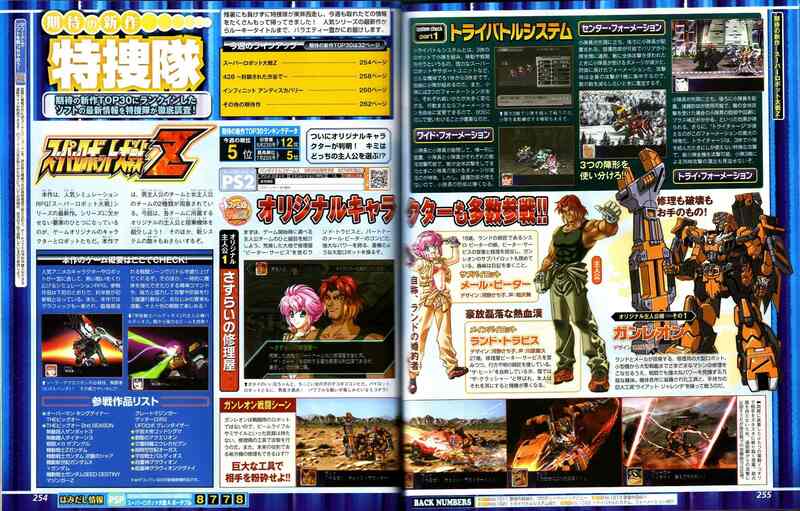 Anyways, seems Famitsu gave Z a 9/9/9/9 - the highest-rated SRW game ever!